Cathy and I were introduced to each other by Marsha Moore, wife of Dan Moore, a physician friend of mine. She and Cathy were teachers together at an elementary school in Atlanta, Georgia. Cathy had just graduated from Florida State University, and this was her first teaching assignment. I was an intern at Grady Memorial Hospital, and Dan and I had both graduated from the University of Arkansas Medical School in Little Rock, so we had been friends for a number of years. Cathy was born and raised in Fort Lauderdale, Florida, and I had never met anyone from that city. My understanding of that city was based on viewing the movie, “Where the Boys Are,” which was a far cry from the reality of a very beautiful and culturally significant south Florida metropolis. After the first few dates, I was stricken not only by Cathy’s beauty but also her sweet and sensitive spirit. I just couldn’t believe that she wanted to continue dating this Arkansas hillbilly, but I didn’t complain and the seriousness of our intentions toward each other escalated. After dating for about 6 weeks, I wasn’t surprised that her parents wanted to meet the young man who was seriously dating their daughter. Cathy’s Mom, Virginia Young, was President of the Florida School Board at the time, and she had a meeting scheduled in Atlanta, so that was her opportunity for us to meet. On the evening of our meeting at her hotel, I was on call in the Emergency Room at Grady and had just finished my shift for the day. I was still wearing my white uniform since I didn’t have time to drive to my apartment to freshen up and change clothes. She told people for years afterwards that the first time she met me, I had on my white uniform which was covered with blood. I really think there were only a few scattered blood spots, but they had sure caught her eye. Overall, I was pretty sure I had made a good first impression despite the blood. Cathy and I continued to date that year and decided that God had meant for us to spend our lives together, so in March 1965, with her father’s permission I asked her to marry me. We were married in Fort Lauderdale on August 7, 1965. I had already moved to New Orleans the prior month to begin my 4 year training in general surgery on the LSU Service at Charity Hospital, and we had a small but nice apartment in Kenner, which was near her elementary teaching job there. A surprise wedding present we endured along with all the residents of New Orleans was Hurricane Betsy which came on September 8, 1965. I have already written about that experience. Cathy’s Mom and Dad were very supportive of us throughout their lives, but we were especially blessed by them in the early years of our marriage. Gram Young kept in close touch with us by phone, and it was not uncommon for her to call 3 or 4 times per week. Those calls were very important for Cathy because many nights she was alone in our apartment while I worked at Charity Hospital, and that contact kept her current on her family and the things happening in Fort Lauderdale. Gram loved to travel and she visited us more often than any other family member while we lived in New Orleans. Financially we struggled because the salary I was paid at Charity Hospital kept us under the Federal poverty guidelines, and it was only the fact that Cathy made a modest salary as an elementary teacher that we were able to pay our apartment rent and the few bills we had each month. We loved receiving a “care package” from Gram Young, because often it contained 2 or more nice dresses for Cathy and occasionally a dress shirt or a good book for me. An added blessing she frequently sent were large sacks of limes from their Key lime tree, with which Cathy made the most delicious Key lime pies I had ever eaten! In fact I had never had eaten a piece of Key lime pie before we married. Gram became more involved in Fort Lauderdale politics when she ran for the City Commission in 1971 and was elected, thus becoming the Vice Mayor. The city’s by-laws stated the commissioner with the most votes became Mayor, while the 2nd largest vote getter was named Vice Mayor. 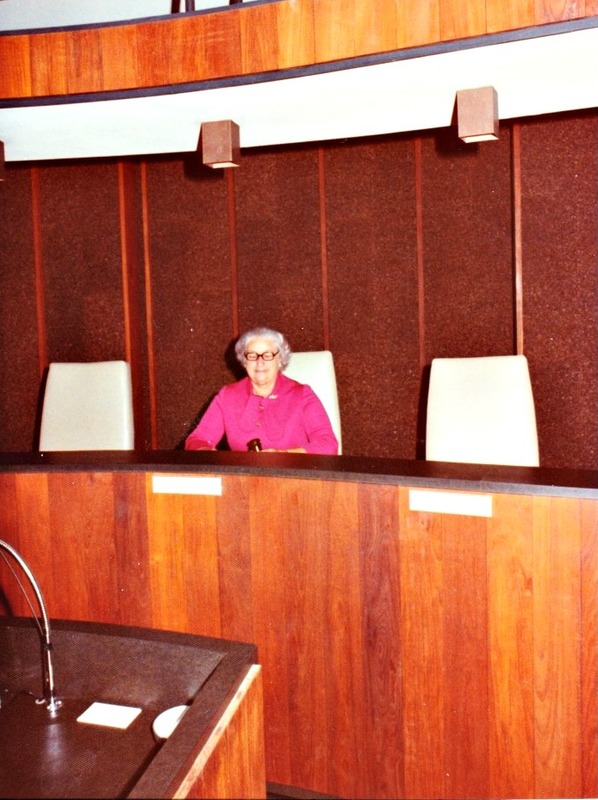 In 1973 following the next election, Gram became the first woman to have ever been elected as Mayor of Fort Lauderdale, and served in that position until 1975 when she was again elected Vice Mayor. She served in that position until 1981 and assumed the unexpired term of Clay Shaw as Mayor until 1982. The city of Fort Lauderdale underwent major changes during those 11 years she served on the Commission, and it was always exciting and fun for us in the family to be on the “inside” of all of those changes. Following completion of my surgical residency in 1969, I had already been commissioned as an officer in the US Air Force, and because our country was at the height of the Vietnam War, I was certain I would be sent to Vietnam as a fully trained trauma surgeon. I was, however stationed in Valdosta, Georgia at Moody Air Force Base. One of the benefits of living in south Georgia was it was only an 8 hour drive down the interstate to Cathy’s hometown of Fort Lauderdale. We were able to visit her parents and her brother and sister much more often than previously. During those years we were able to witness up-close Gram Young’s skill, both as a grandmother and an outstanding city administrator. I frequently marvelled at her ability to deliver as many as 6 speeches to various organizations in one day without the use of notes. I always wondered if she ever was confused about the organization to whom she was speaking and called them by the wrong name. As far as I know, she never did. When she was home, she always took off her political hat, and was very content to be a grandmother. The only evidence in their home of her importance to the city were the number of phone calls she received daily. This prior to the universal use of cell phones, and she was able to get some phone call relief by going with us to the shopping mall or to the beach. Near the end of her life, she was honored by the city of Fort Lauderdale by 2 significant presentations. A city park and a new and magnificent elementary school were named for her and both had great personal significance. Throughout her adult life she worked diligently to make Fort Lauderdale more family friendly, and she also made public education an equally important priority. Whenever Cathy and I go back with our family to visit Fort Lauderdale, we never fail to visit these two sites and reminisce just how important Mayor Virginia S. Young was to that city and what a great Grammy she was to all of us. I remember meeting her at Mary Kay’s bridal luncheon. It was the first time that I ever sat at the same table with 2 other “Virginia’s!!!! Plus Mary Kay’s sister. I felt it was the “convention” of the Virginias!!!!! I certainly enjoyed now hearing about her life!!! I so enjoy all of your stories ! Thank you for writing them..
Gram Young sure was a WONDERFUL grandmother! Our visits to her home were always filled with adventure, fun, good conversation, laughter, and love. I have always been proud to be called her granddaughter. She was a cool “Grammy!” She introduced me to many firsts that El Dorado didn’t offer in the 80’s..a ride in the Goodyear blimp, eating at a fondue restaurant, eating at a Japenese steakhouse that cooks at the table, riding in a glass bottom boat, and visiting an alligator farm to name a few. We always looked forward to the time we spent with her and Granddaddy in Fort Lauderdale. That 2 day, 18 hour car trip was rough scrunched between John and Mary Kay in the back seat of the station wagon!! When we finally arrived we knew we were in for an exciting week! As I was preparing to write this remembrance, I really enjoyed re-reading all those newspaper articles concerning her that you sent us years ago. Our children are passing the stories of their heritage from Grammy and Granddaddy to their children, and this is part of the motivation for my writing them. We all love and appreciate you, Norman and Clay. Thanks for putting our beautiful memories of Grammy Young in writing, Uncle John. She was a great role model for all of us, especially the girls in the family. I make sure my kids know all about her and grandaddy by REPEATEDLY telling them my stories about her. Their favorite is her story from the great hurricane of 1926 which occurred a day after her 8th birthday. She was the second eldest of 8. When the house filled with water from the storm surge her dad placed the younger kids who couldn’t swim in the drawers so they wouldn’t drown so they would float! All she could think about was the piece of rose chintz fabric she had received as a birthday present for a new dress. It was ruined. Sure do miss her and her great stories! Whenever our family gets together, there are at least 3 or 4 stories told about Gram Young and especially the one about surviving the hurricane in 1926. Cathy and I want to make certain that all of our grandchildren visit Fort Lauderdale to experience the wonderful heritage of Grammy and Granddaddy Young. I will be writing some of the stories related to both of them. Thanks Jenifer for your encouragement. We love all of you and wish we could get together more often. What about another reunion?